Courtesy of Fellow Robots, Inc. In our previous post we looked at socially engaging robots and how they are helping to break down barriers to remote presence. Another area on the fringe of telepresence is service robots. These robots operate autonomously, but have the ability to be controlled in telepresence mode when the need arises. The symbiosis between robot and machine allows these robots to take care of easier things, while allowing humans to take over when it needs help. As autonomy improves, the bar moves higher and higher. 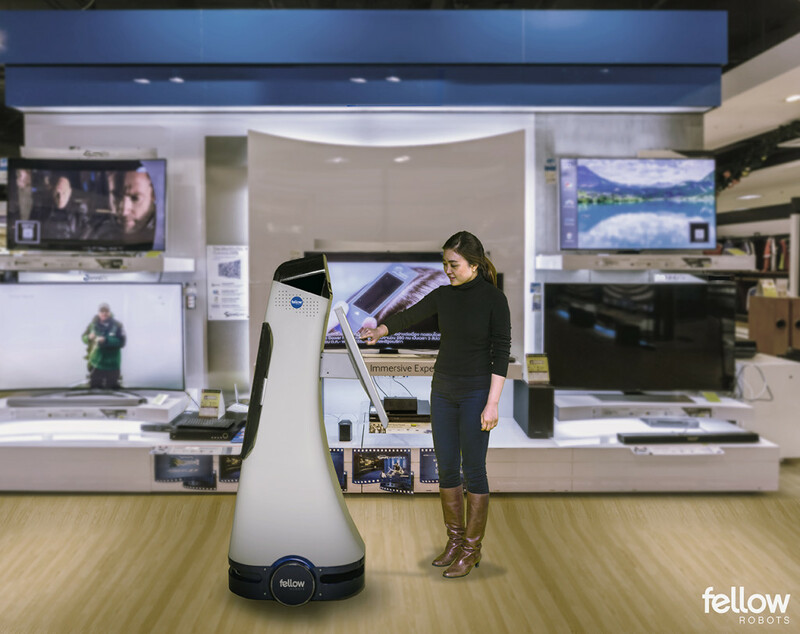 In October 2014, Suitable Technologies opened the first retail store staffed only by Beam telepresence robots. Two months later, Orchard Hardware in mid-town San Jose began using the semi-autonomous OSHBot by Fellow Robotics. OSHBot has image and voice recognition enabling it to guide customers up and down aisles to the items they are looking for — most of the time. Fellow Robotics, still in the pilot phase for the project, is improving certain processes like natural language recognition. Phrases like, ‘lawn mower’, ‘lawnmower’ or ‘lawn-mower’ can be a problem. However if an issue does arise, an associate from another store can login to help with more technical questions. No different than doctors using telepresence robots in rural hospitals when an expert isn’t physically available. Silicon Valley isn’t the only place where you can find examples of service robots in retail. REEM, by Pal Robotics, recently spent the summer on Yas Island in Abu Dhabi. When at the mall she (yes, she) helped shoppers and tourists find their way, along with taking lots of photos. The team at Pal Robotics are also working on a bipedal unit called REEM-C, a robot that could potentially rival Honda’s ASIMO. REEM has two advantages: its use of ROS and availability to researchers. As of now, ASIMO uses proprietary software and he’s not available for sale. Service robots are also entering homes as well. Korea’s Future Robot first unveiled FURo-i at CES in 2015, a home assistant robot, designed to maintain your home while away and chat with friends and family when you are there. Robot Base, out of NYC, also debuted ‘Personal Robot’ at CES in 2015. Think of Personal Robot like Siri on wheels, which can play your favorite music and remind you of upcoming appointments, ‘Personal Robot’ comes with advanced connectivity and autonomous algorithms to automate your home, like turning off lights and turning down the thermostat when you aren’t there. Recent media attention has gone to Buddy, by Blue Frog Robotics, due to its highly successful Indiegogo campaign (perhaps you saw it on RoboHub). Buddy is certainly the cutest robot of them all. Buddy can integrate with IBM’s Watson cloud services improving natural language and object recognition, along with the typical personal and home assistant functionality you would expect. We’re now reaching the end of our telepresence series. In the final part, we’ll talk about the future of telepresence and where it could be headed.